Noah displays the newly-completed workbooks, to help project participants frame their visits! I'm excited to announce that we've mailed our workbooks! 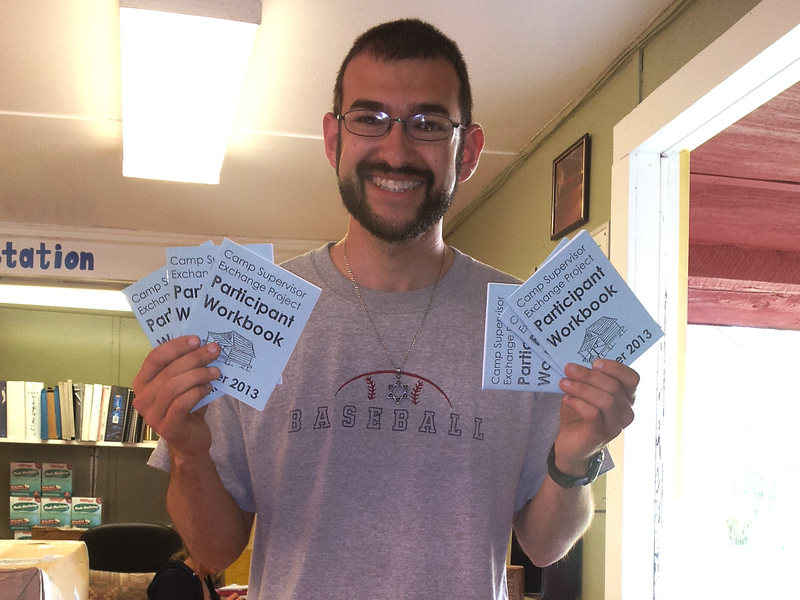 After several weeks of writing, editing, and assembling the workbooks, they're on their way to the nine participating camps, where supervisors will use them before, during, and after their visits. The pre-visit conversation, with the director of their home camp, will help the supervisors set goals for their visit. Later, the post-visit conversation will help them select ideas for implementation, and secure buy-in from colleagues. But the core of the workbook encompasses seven content areas with prompts and questions designed to optimize the observation process. . The tabs in that section are my favorite part of the whole workbook. (And they only took a few hours to cut and assemble!) Since the supervisors will be inundated with sights, programs, and ideas throughout their visit, I created a handy set of tabs to allow them to instantly flip to the relevant section and record their findings. This allows them to spend more time observing, and less time fiddling with the workbook. This seems like a good time to credit my project mentor, Sarah Raful Whinston, with the initial idea for pocket-sized workbooks. As we were struggling with formatting late this spring, and trying to avoid bulky clipboards or floppy packets, she suggested a quarter-fold booklet. We realized that participants could carry them easily and constantly, and that it would feel a little more professional than a set of printed-out pages. Just one of Sarah's valuable contributions to this process! Ultimately, I'm thrilled that we're about to start testing this project! The first camp visit is this coming Thursday, and I can't wait to see how well these materials work in the field, and how we can improve them for future use. As always, check back here on the blog for more exciting updates! 1 Comment - add your thoughts! What a fantastic idea! The booklets will certainly streamline the process of organizing observations for the participants. Perhaps they will be helpful to you as well after the exchanges are complete and you evaluate the project. About the project Read the blog! Participating camps Financial support Stay in touch! All content Â©2010-2013 - Institute for Modern Judaism. All rights reserved, including program reproduction and facilitation.